A few winter trucking safety tips for professional truck drivers. Driving challenges increase in the winter. Weather you are a old professional or a newbie driver there are rules to keep in mind that will help keep you safe. Before you start the trip, clean off the windshield and all windows. Wipe off the headlights, tail lights, stop lights and turn signals. Use your windshield wipers often. Winter is coming! Are you ready? Here are a few useful winter trucking safety tips. * Carry and use a fuel treatment product to prevent diesel from gelling. * Carry extra blankets..... enough to keep you warm in case you get stranded. * Carry a supply of "energy food" such as energy bars,etc., and water. Also have a supply of non-perishable foods,clothing and emergency supplies. Maybe a few MRE's (meals ready to eat) the new ones are self heating. * Keep the fuel tank on your truck as full as possible at all times. This will help eliminate condensation in the fuel tanks. When coming off the road and sitting, fuel before leaving the truck sit. Waiting to fuel when you are ready to go back out allows condensation to occur which can increase the chances of fuel gelling. * Allow extra distance between you and the vehicles ahead of you. More winter trucking safety tips. *SLOW DOWN. 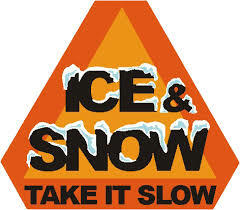 Adjust your speed appropriately for the road conditions. * Avoid using the cruise control. * PLAN AHEAD. Know where truck stops are ahead of you on your planned trip so you can make the appropriate stop should the weather turn really bad. * If the time comes where tire chains are needed.... STOP! * If you are taking a load into "chain law states" be sure to pick up chains at your terminal. Cost of chains almost double on the road. * If you take your truck home with a load PLUG IN YOUR TRUCK an if needed start and run it periodically to insure that it will start when you are ready to leave. Turn off all accessories and unplug any items such as refrigerators, TV etc. If you take your truck home it is your responsibility to make sure it will start! * Carry a bottle of air line anti-freeze (Heet works as well) to shoot through your air lines if brakes freeze up. Watch the weather and look for unusual participation patterns. Check the weather channel if possible,listen to radio reports and talk with other drivers on the CB if possible. The information may prepare you for upcoming poor driving conditions. Extra windshield antifreeze is recommended.